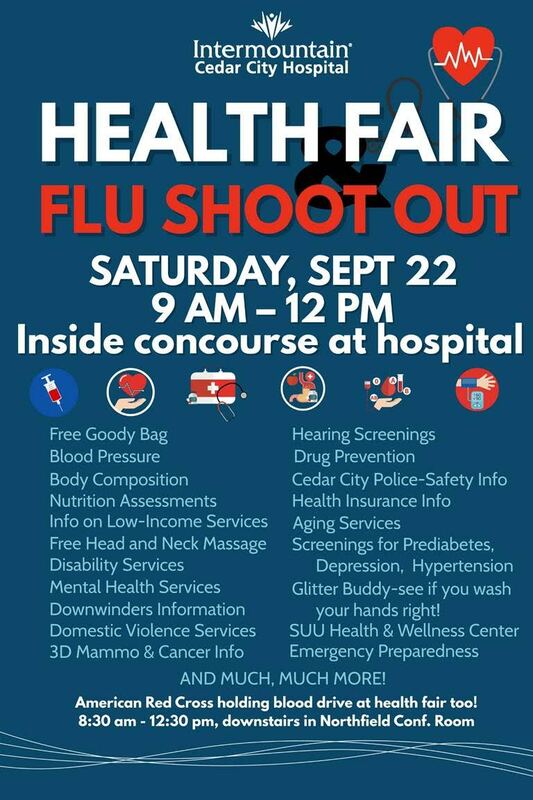 CEDAR CITY– In addition to screenings and healthy lifestyle education, the annual Cedar City Hospital Health Fair on Saturday kicks off a series of flu shootouts around southwest Utah – including a drive-through shootout in St. George – in preparation for the upcoming flu season. The health fair will take place Saturday from 9 a.m. to noon inside the concourse at the Intermountain Cedar City Hospital. There will be giveaways, information about health-related issues – including disability services, drug prevention, domestic violence and downwinders – and a variety of screenings for things like hearing, blood pressure, prediabetes and depression. The American Red Cross will also be hosting a blood drive from 8:30 a.m. to 12:30 p.m. in the Northfield Conference room. They will also offer a glitter hand wash to determine how well a person washes their hands, free head and neck massages and of course, flu shots. The Centers for Disease Control and Prevention recommend that everyone over the age of 6 months receive a flu shot to reduce the risk of influenza. While the flu vaccination is not guaranteed to prevent the flu, it often does keep a person from contracting it or reduces the symptoms if they do. The effectiveness of the vaccine depends on how well it is matched with the year’s virus and the person receiving it which can vary depending on age and health. In years where the vaccine is well matched to the virus, it reduces the risk of illness between 40-60 percent for the overall population and is considered the best protection there is against the flu. Read more: Flu Season 2018 and the flu shot; did it work? Flu shoot-outs are also planned by the Southwest Utah Public Health Department in Washington, Iron, Kane, Beaver and Garfield counties. The health department is hosting a drive-through flu shootout at the Red Cliffs Mall parking lot Tuesday from 8 a.m. to 1 p.m. Drive-through participants must be at least 18 years old. For those younger than 18 or who do not wish to be vaccinated from their car, an indoor flu shootout will be held at the Red Cliffs Mall Center Court the same day from noon to 5 p.m. The vaccine costs $20 or is free with certain insurance coverage. Health department officials recommend that those receiving the vaccine wear short sleeves and fill out and print the online consent form to save time. Vaccinations are given on a walk-in basis and no appointment is needed. The flu shootout is also an opportunity for the department to practice their community emergency response plan, which would be deployed in the event of a bioterrorism attack. In Beaver, a similar drive-through and walk-in combination flu shootout will take place Wednesday from noon to 4 p.m. at the EMS shed and at the Garfield County Fire Station Oct. 12 from noon to 4 p.m. Garfield County will also have a walk-in shootout for all ages at Ruby’s Inn Oct. 18 from 1-4 p.m.
Kane County will have their flu shootout during the Kane County Health Fair at Kanab Middle School on Oct. 13 from 9 a.m. to 1 p.m., which is free for all Kane County residents and available for all ages.